Looks cold enough for that wee doggie to need a Snuggie!! :) My daughter is also 9 and would love us to have a dog - we have a hamster and are going to get a rabbit in the Spring. 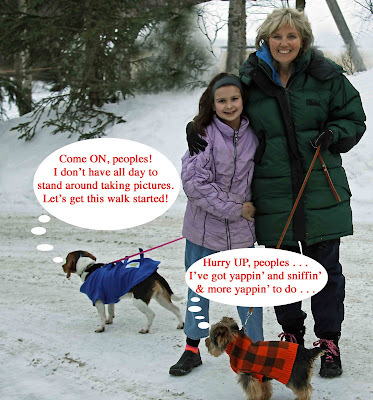 A dog must have to be very fashionable in Alaska! Looks like Ollie packed very well for his visit. That is one young-looking grandma!! Wow! I would have a hard time believing she was even out of her thirties! I saw the snuggie for dogs at Bed, Bath and Beyond when I was doing my christmas shopping!! Couldn't believe now dogs have their own snuggies! That's so precious. She looks so happy in the picture too!